I know this is a very simple dress, but I am pretty happy right now! I feel more ‘me’ when I’m wearing this dress! To me that’s what makes a successful ‘make’– When you feel like you are really showing your personality/personal style in the garment and it fits your lifestyle. Let me tell you something about my lifestyle:I live in a small apartment in Sydney Australia, I am at home a lot, and right now it is HOT. I love the heat, always have, but it really does feel like I’m living in a greenhouse, so a loose fitting cotton shift dress is just what I need! I went shorter than I ordinarily would…because the dress is such a loose shape I felt like the short length made it more flattering/youthful. The pattern is New Look 6225. It’s actually a top pattern, but I always planned to lengthen it into a dress (because I love love love raglan sleeves). The fabric is a mysterious cotton bought years ago at Spotlight. There was a whole roll of it for sale (over 6 meters) for something crazy cheap like $9 for the roll. I bought that whole roll. That was an awesome day! The bold ‘geometric print cotton fabric I used. 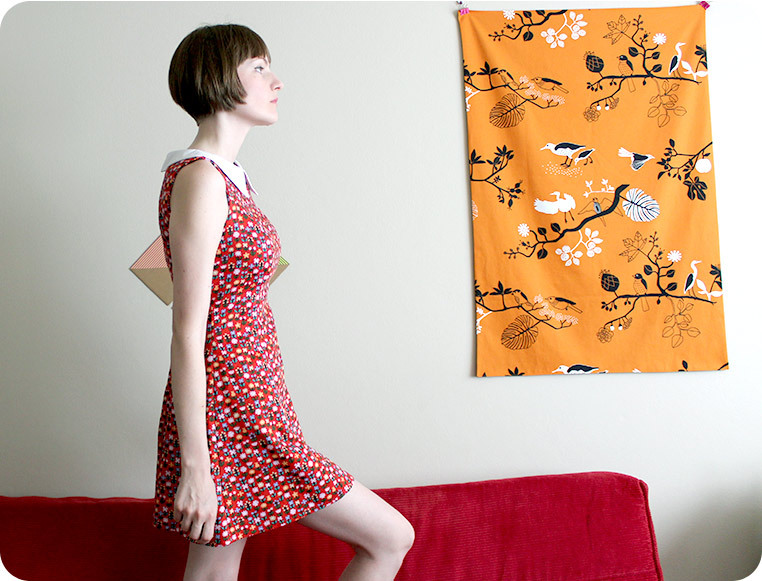 I have made a dress from this fabric before, but I feel like this shift dress works much better with the print! No zipper/notions or buttons required! This dress slips over my head. Gotta love that! Quick and easy too make. Normally I would be apprehensive about using a ‘new look’ pattern, because the fit of ‘new look’ patterns is often very poor, but because it was intended to be a loose fitting garment I went ahead and tried it. New Look patterns are is the king of too much ‘ease’. This is why I made a size 8 and sewed the seams allowances at 2cms, rather than the usual 1.5cms (in effect removing 5mm from the seam allowances from all the pieces). 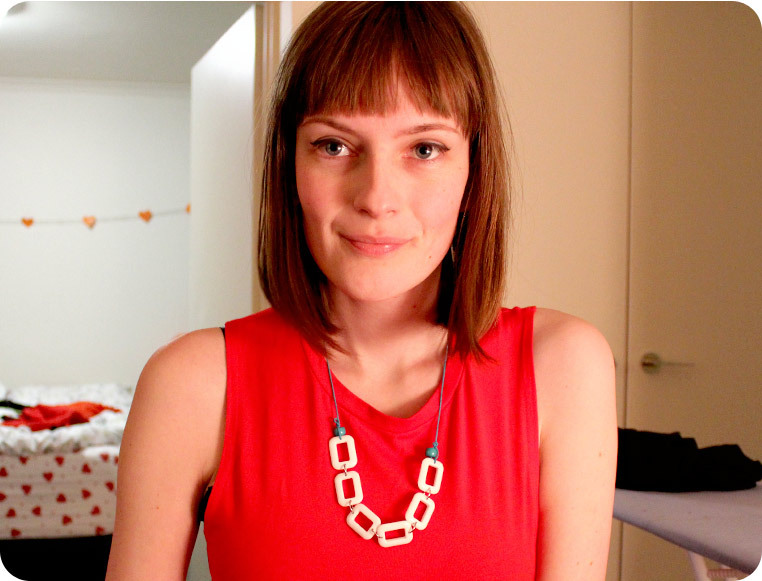 I used a 85cm long bias strip for the neckline. I made it much wider than the pattern suggested (so it was easier to work with). I didn’t use bias binding on the sleeves, I just turned and stitched them like a regular hem. 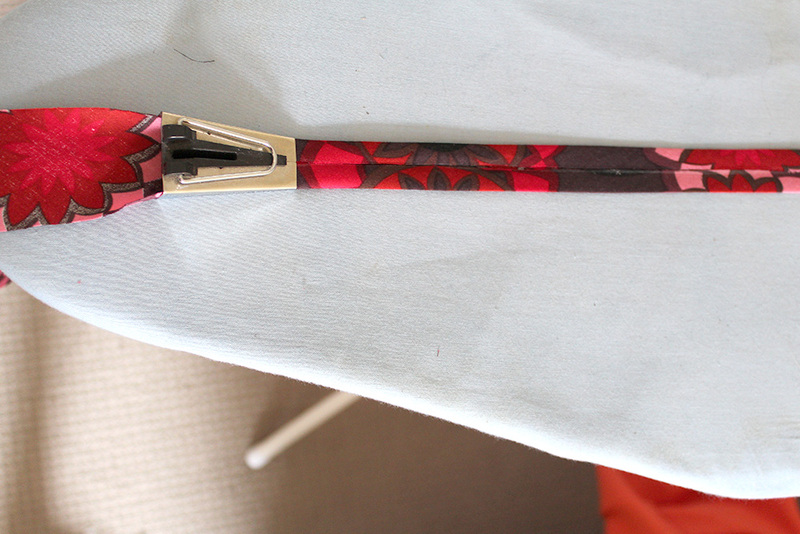 Truth be told I am not a massive fan of using bias binding. I love the way it looks, but it feels sloppily done when I do it. Perhaps I just need practice! I can’t remember why I did it, but I added a seam to the center back, rather than cutting it on the fold. It may have just been a more economical use of fabric in this case (it would probably look better cut on the fold). Seam treatment: I just overlocked them, but this kind of dress that would have been a good candidate for french seams. I’m pretty lazy when it comes to changing the colour of my overlocking thread… I overlocked the garment with white overlocking thread. Yes I am THAT lazy! Sorry.Once I am more professional perhaps I will make the insides of my garment nicer! 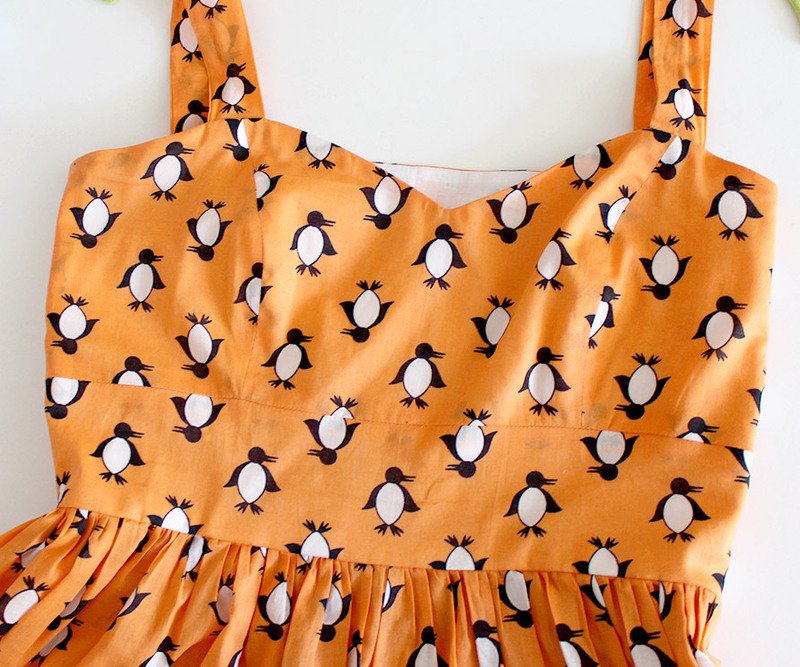 I am already planning more dresses using this pattern. I love the idea of doing one where the sleeves are in a contrasting fabric. Fun! 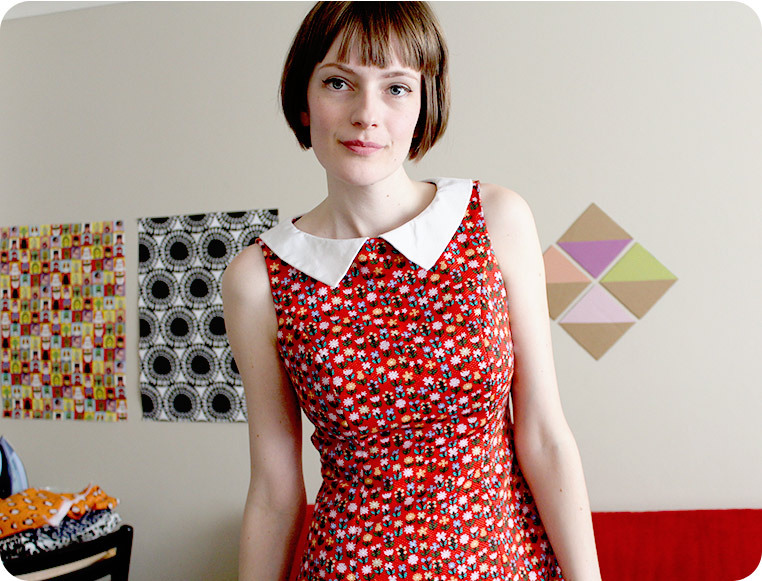 In the spirit of my obsession with 60s shift dresses I finished another one during the weekend. 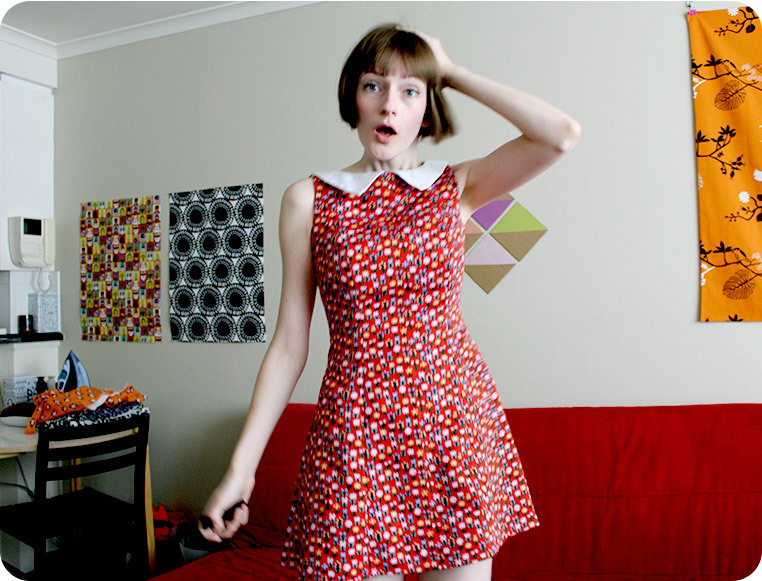 Would you believe that it’s so hot where I live that this 60s mini dress is too hot to wear today? I’ll have to wait till it cools down. Sydney weather in a small apartment means I can only wear singlets and shorts. 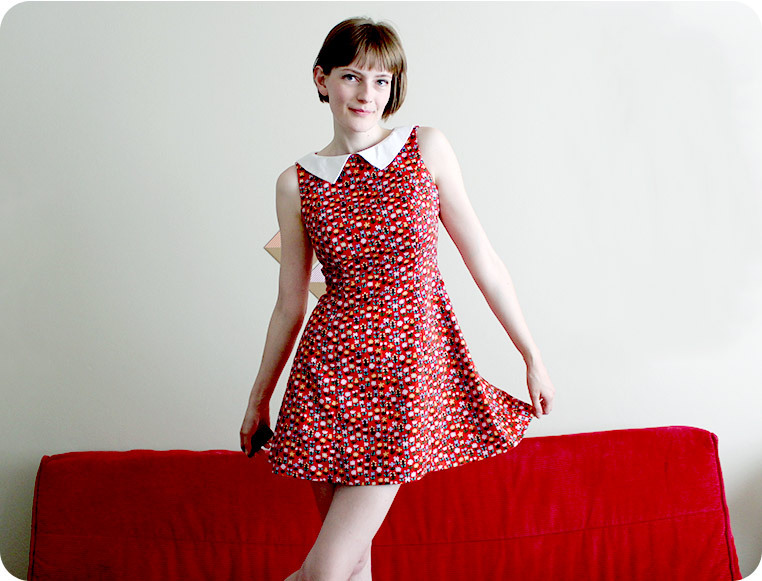 Fabric and pattern: I was doing some sewing with my niece some weeks ago and we were using Burda 7056 to make a shift dress, it was turning out so cute, I had to make one for myself. I cut a size 8. This pattern has much looser relaxed fit than the previous shift I made. The fabric used is one I was not too precious about because when I’m sewing a pattern I haven’t tried before I tend use the fabric that I’m not madly in love with. I must have bought this fabric a couple of years ago from the clearance table when I worked at a fabric shop. I think its a stretch sateen, it has a nice weight to it. Looks like it could have been used for cushions or home decor, but I think its dress/fashion fabric because it has a light sheen too it and a little bit of stretch. When I worked at the fabric shop I just bought meters and meters of a fabric if it was cute and very cheap ($5 or under). I am so glad I did because don’t think you can get much at that price anymore. I get all my zippers from the remnant warehouse because you pay $1 per zip, rather than the $4-5 they usually cost. Isant that mad? longer zips (over 45cms) in Australia are usually $5 each or more! Changes made: Initially I changed the armholes (on the pattern and fabric, extending them) in order to make the dress bra-friendly, but it ruined the whole look, so I ended up cutting out the armholes the way they were intended to be. I ended up shortening the hem considerably. With such a loose fit, I feel like it works better to make it shorter, but I shortened it so many times that I lost count of home much I shortened it by (I hemmed it twice which was rather annoying). I also changed the neckline, I lowered it considerably because It was one of those necklines that was so high that the original cut was quite uncomfortable (which meant I also had to redraft the front facing BORING but essential). While we are on the subject of facings: These facings are tedious! I almost think that its probably quicker to sew an entire lining than getting these facings to behave, but I guess I am getting better at them, good practice I suppose! When I tried the completed project on for the first time I felt like it needed something, but now I think the opposite, best to keep everything (except makeup) minimal when wearing this dress. I like how streamlined it is! I was worried that the massive dots would look too clown-like, and perhaps they do look a bit clown-like, but I think its kind of cool. I do really love the mod look so I guess this fits the bill. My hair is pinned back and I think that it suits the dress more. 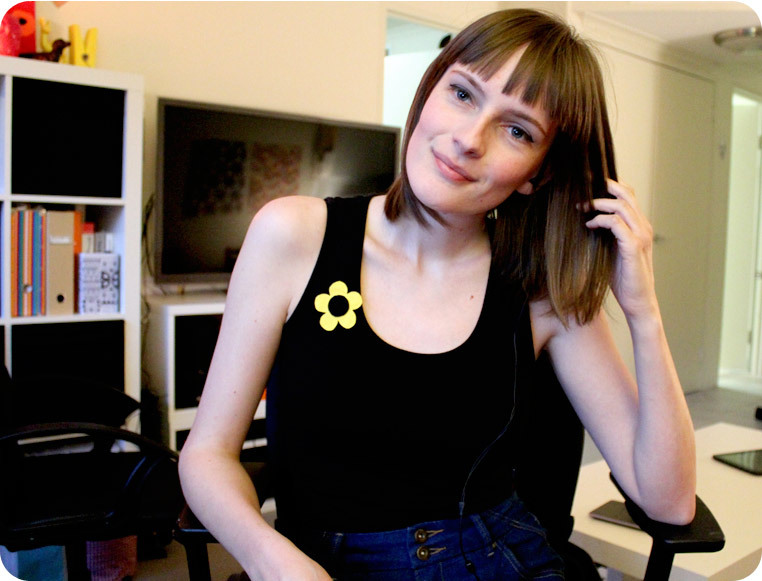 I have had a fringe/bangs for over 7 years but I am growing my fringe out, because I want to get a twiggy-esque haircut where the hair is longer at the front a super short at the back. A hairdresser once told be that I would not be able to pull off very short hair, but I feel as if I should forget what he said and give it a try. What do you think? I have been on such a sewing kick lately. Much more to come! Wow guys! I made sewing plans and I stuck to them (that is so unlike me). It may be a little boring…. 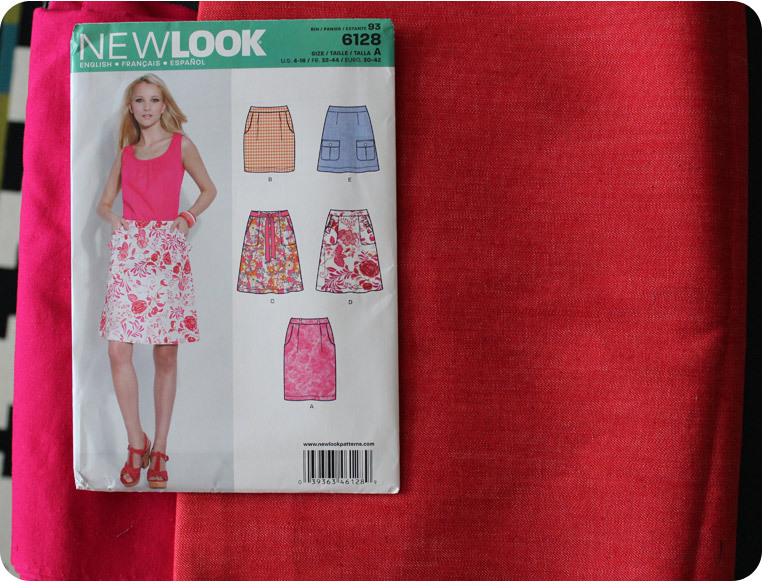 I wanted to make a skirt using new look 6128, so I could test out the pattern just to see if it was worthy of special fabric. I wore this outfit today and photographed it when I got home meaning that this is how the skirt looked after a day in the city. This denim is lovely and pretty crease-resistant I think I bought it at the remnant warehouse a long time ago. You can see some creasing on the back, but that was after a whole day of wearing it. 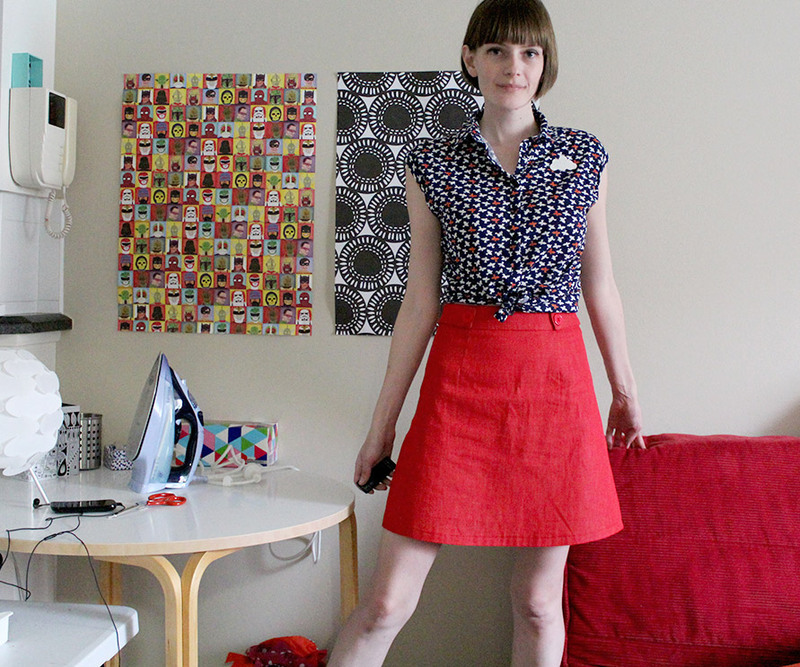 The verdict on the skirt: It goes with a lot and I like the a-line shape. I love things in bold solid colours! BUT I did have some issues with the skirt shifting around on my body while I walked. Suddently the side seam would be at the front. SO annoying! is it a bad fit, or can I remedy the situation by adding a belt and belt loops to my next version? Because I took it in so much it sits above the waist, I think I like it but I’m not sure if it’s flattering. 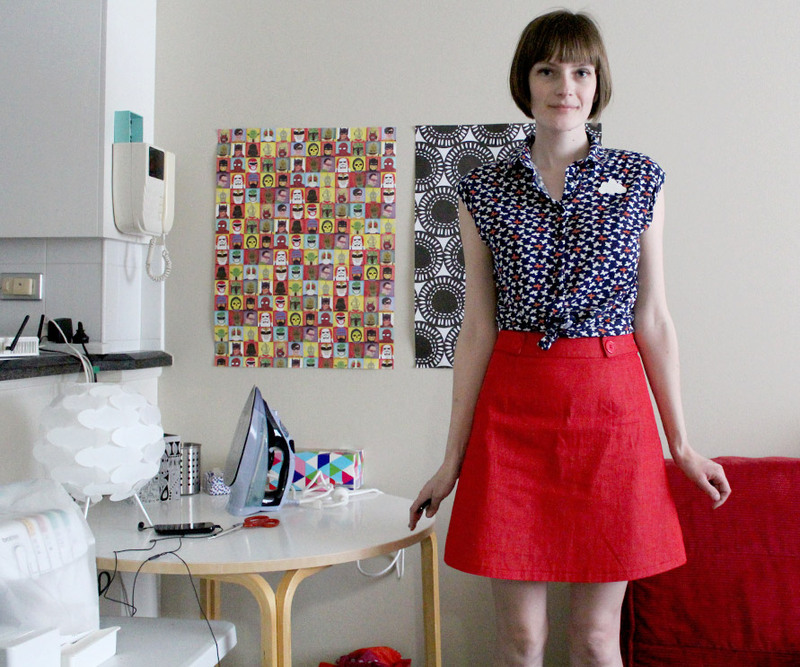 I can never tell when I make skirts If I am going to like them. Does it sit too high? 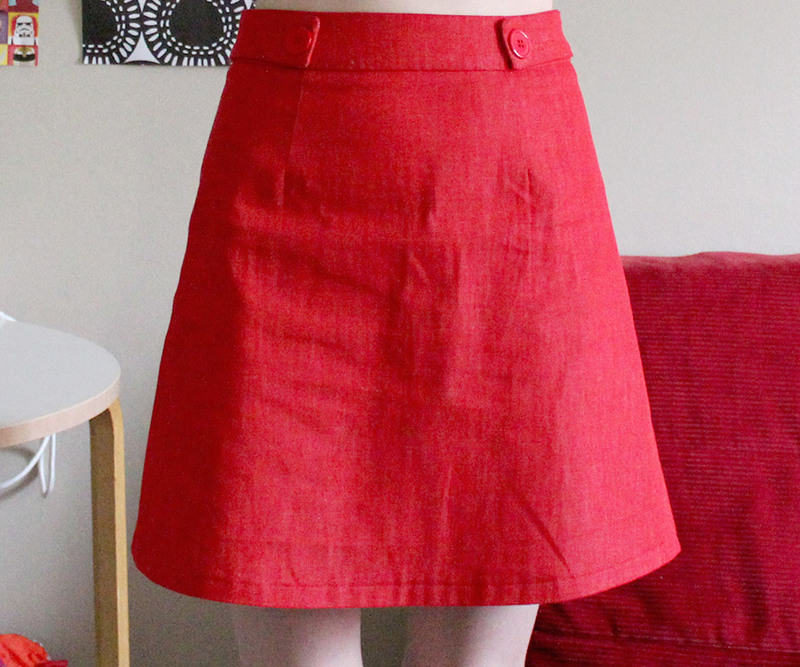 I cut out the pattern size 8 but I ended up taking the skirt in by around 6mm in the waistband, side seams and the center back (before I installed the zipper). If I try on an australian size 8 skirt in a store it would be on the snug side but I was positively swimming in the newlook size 8. 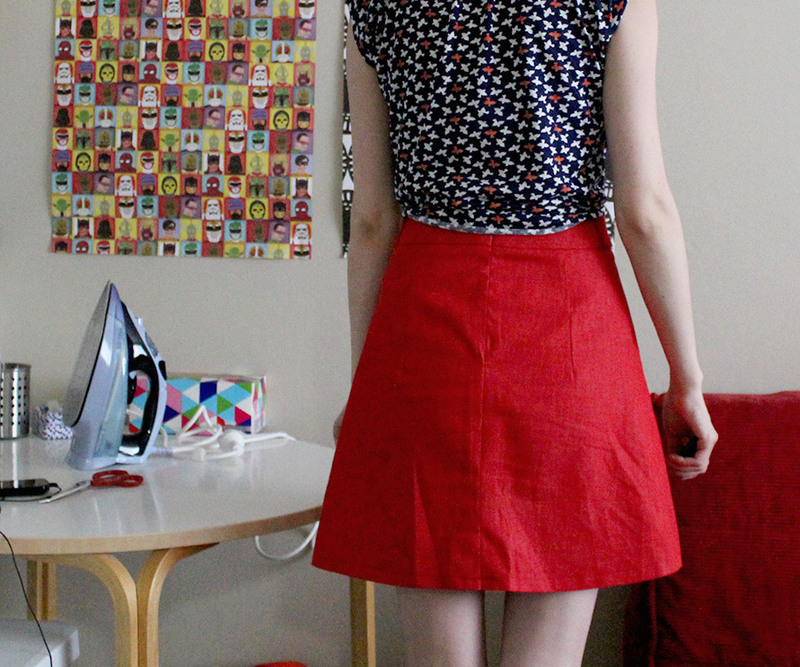 I also lengthened the darts on the back of the skirt by about 4cms. The darts could probably do with being wider I am not blessed with a round behind…Its kind of awesome how lengthening the darts can fix the fit like that. So if your behind is like mine and on the flatter side try lengthening the darts! 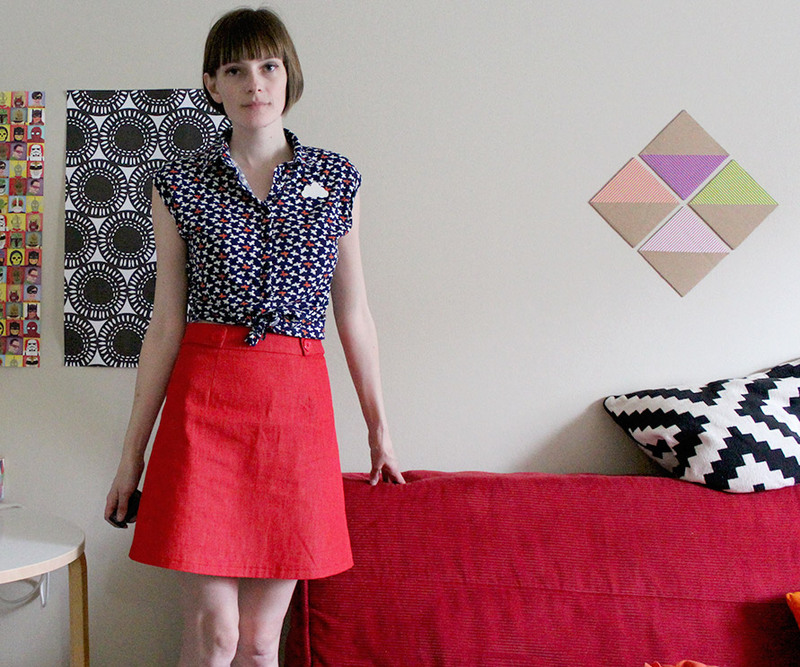 I LOVE patch pockets on skirts and I did cut out the triangular ones, but they were not doing it for me. I wanted to cut out rounded patch pockets but I couldn’t find the remaining red denim so instead side-tab things with buttons for decoration. I do enjoy an oversized button or two (I found these ones at a dollar store haha)! I want to do a lapped dress zipper, much better for heavier weight fabric and for skirts. I actually find invisible zips much easier and I have not used a non-invisible zipper in a sewing project since I was a teenager. I’m sort of scared. I’m hoping my adding belt loops (and belt) it will stop the skirt shifting around on my body as I walk. 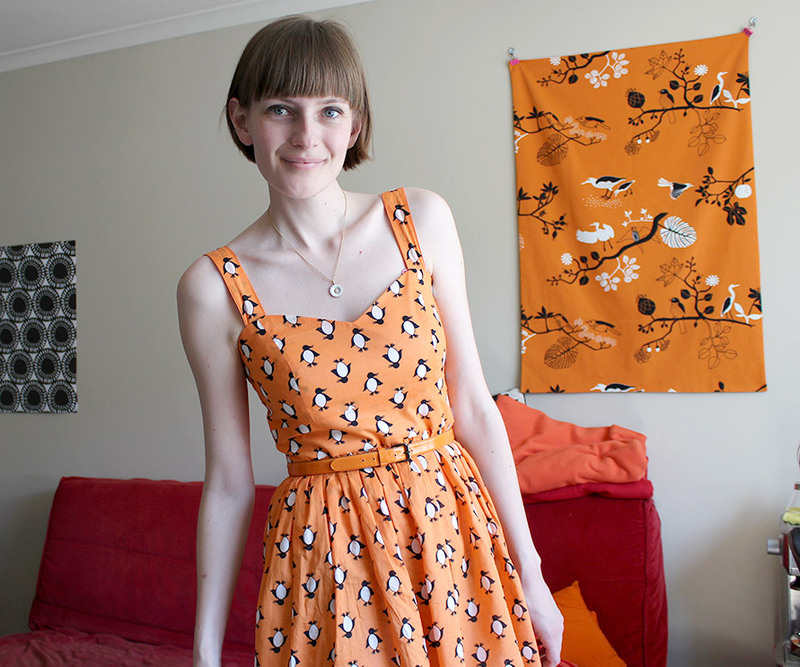 The dress is made from a lightweight cotton I bought at The Remnant Warehouse. It’s a lot like a tana lawn, it’s lightweight and breathable. There is a trade-off as the fabric is a little delicate. The pattern is my own design (I have made countless dresses with this pattern). I had this dress lying around half-finished for god knows how long (I’m sure you know the story). The bodice is lined and there is an invisible zip in the side seam. I took it in 6mm on the zipper side before I installed the zipper. As you can see I didn’t match my print very well on the front of the bodice, but I am not really fussed , but next time I will be more careful (at least on the front). 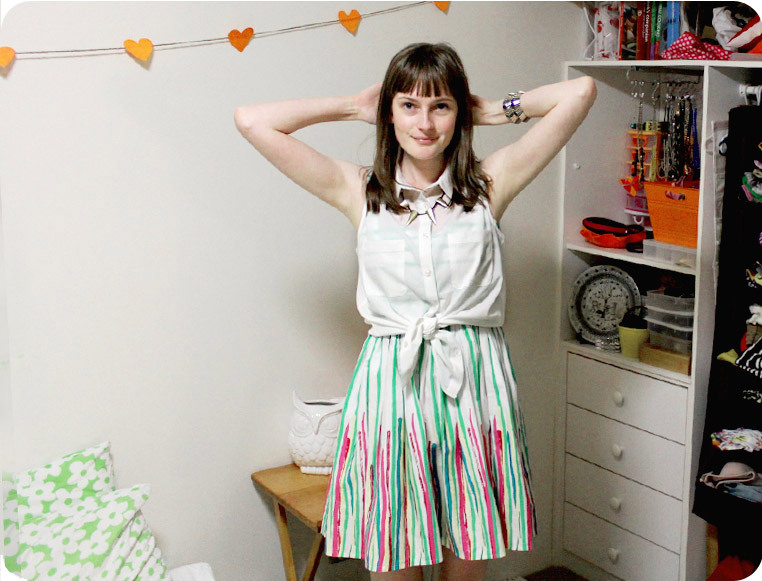 I didn’t line the skirt, because I always wear denim shorts underneath sun-dresses and skirts. I do wish the straps were a little shorter and the waist is pretty roomy. I must like the dress because I have worn it 3 times already. I would say it suits my personality well. 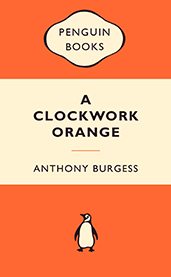 Above: The movie is as good as the book. How often does that happen? My copy of this is in storage since I switched to kindle. 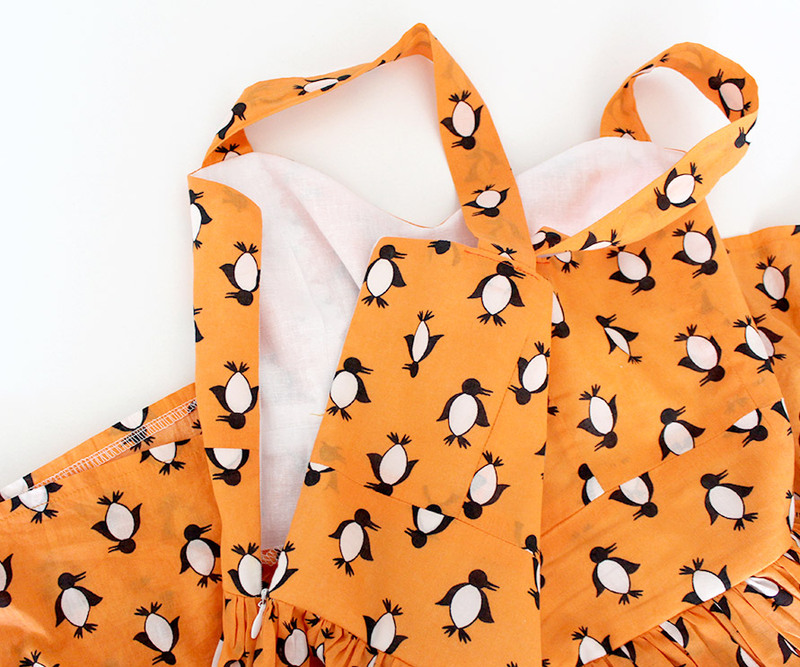 The penguins on the dress are obviously not the same as the logo, but my boyfriend calls it the book dress. I finally finished it! I really feel like this dress is completly my style! I apologize for the large amount of pictures, but if you can’t be a bit indulgent on your own blog then when can you be? It’s a little shorter than I normally go, but I feel like it works with the style. I think this is going to be my Christmas dress. It’s one of the rare occasions where I am not in hiding and get to dress up. I had trouble drafting the collar, it doesn’t sit as flat as I would like it too! Prior to sewing the collar and facing on I was a little apprehensive with how big the collar would look, but I think it works, especially with my short hair. These days I try to be careful of over-fitting. I feel like this has a bit more ease. I need to move in it after all! One of the older dresses I made gets zero wear because I cant move my arms properly in it. But in this one it’s no problem. The fabric is a cotton pique…Back when I worked in a fabric shop I bought something like 6 meters of this stuff at something crazy like $2.50 per meter. The fabric/print looks kind late 60s early 70s to me. The collar is white drill and a white calico on the underside. This dress is so quick to sew, but it took forever because I made muslins, altered the fit and even copied the paper pattern multiple times. But now I have a great fitting pattern for future projects so I guess it is kind of a win. Did I mention how much I love princess seams! So easy to alter and the fit is so lovely. 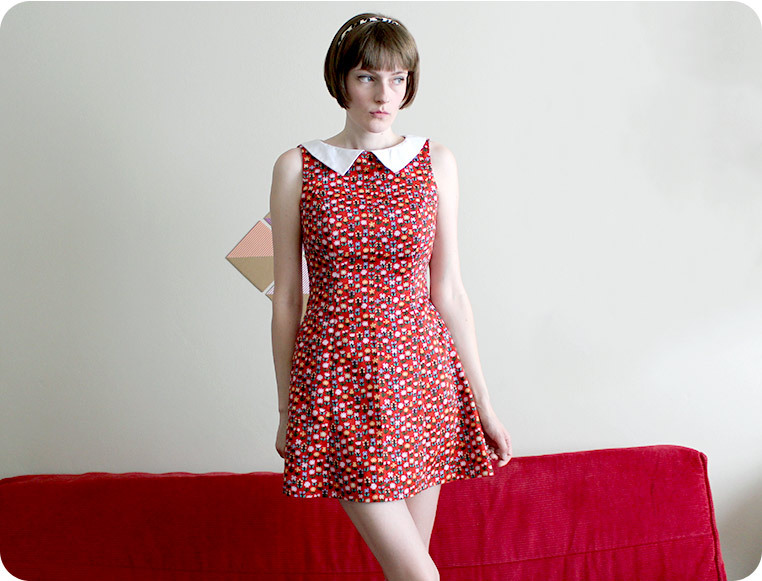 Last time I tried to make a 60s dress, I made a shift dress in a fabric that was super drapey (to much drape for the project) and the darts were all pointy, I hate when that happens! The collar at the back should be closer to the zip. When I drafted the collar I overlapped my pattern pieces as the shoulder seams by 7mm. I think I will try 2cm next time. This collar drafting business is hard (at least for me anyway). Just thought I would mention: I will be posting more sewing ‘makes’ soon(ish): Unfortunately I have issues with my leg/s when I sew too much. I don’t know how to correct this, but if I sew to much I get pain in my legs that can often last for months :(. So annoying! I have had this problem in the past and its best to avoid sewing for a while. 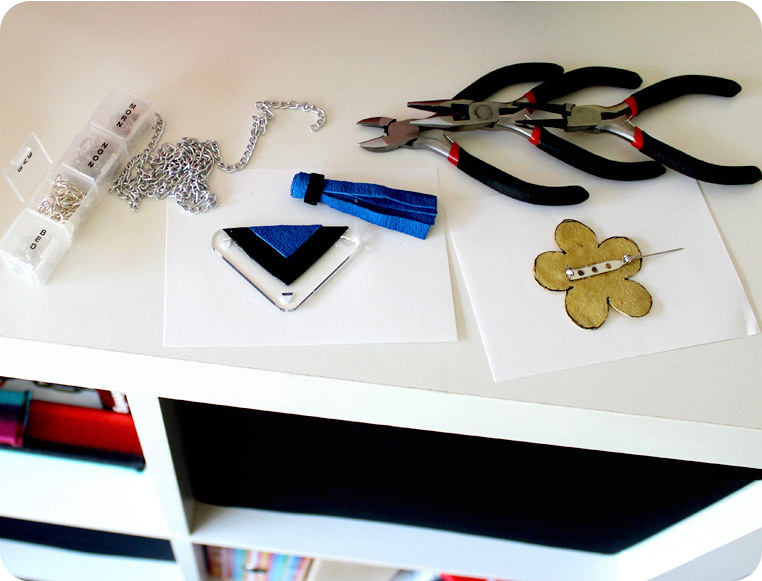 If you have some chain, jump rings and a set of those jewelery making pliers (I don’t even know the technical term for these) you can combine all these things to make jewellery that is more your style, and that no one else will be wearing. I love that! Above: My favorite. A brooch from leather scraps. More on this later. 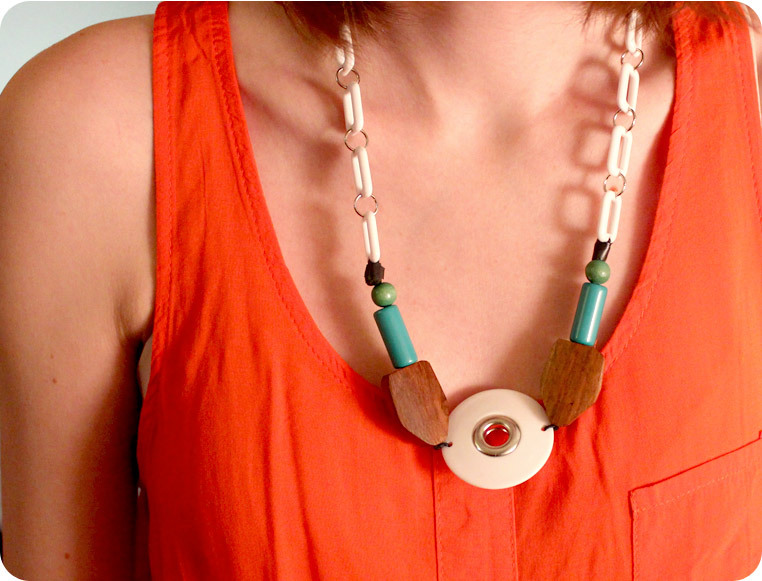 This necklace was a mish-mash of beads I took from 3 other necklaces I owned (but didn’t like) so I dismantled them. I like this piece with my orange top. 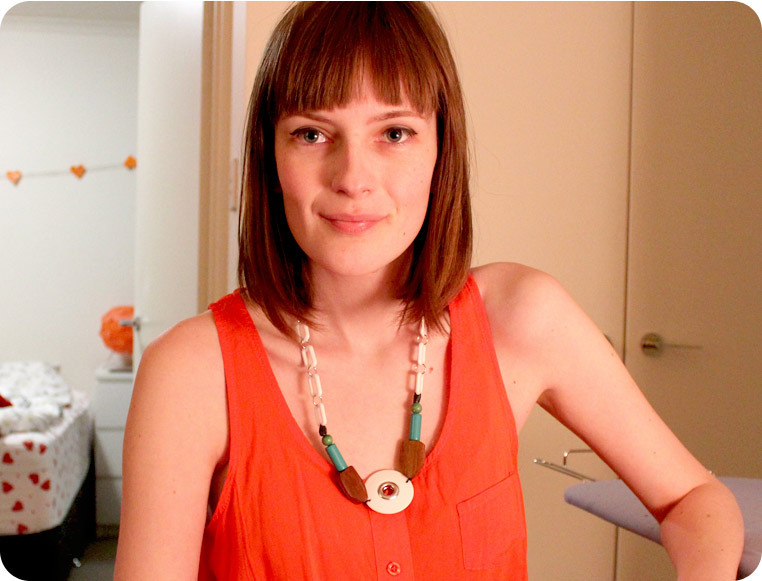 But then orange is my favorite colour (has been since I was a teenager) so I feel like everything goes better orange. Orange makes me happy! I like the mix of wood, colour and plastic! I don’t know why I had to use duct tape in this one but bah who cares. Above is another one made from parts of the same necklaces. Fun fact: Pill boxes are a great way to store jump rings and small jewellery supplies. Anyway my point is making something new that is ‘your style’ out of things you already have. That is what I’m about! Formerly ‘handmade clothing in action’ I am Re-naming this type of post to “wearing handmade” or perhaps I should call it ‘look I wear the stuff I sew sometimes’. Today I am wearing a dress I made a year ago. I feel very different about this dress now. I still like the print but I’m not sure about the proportions. The dress has taken on the role of a skirt today. The rest is not handmade only the scrawl/scribble dress. This outfit feels very 90’s to me. 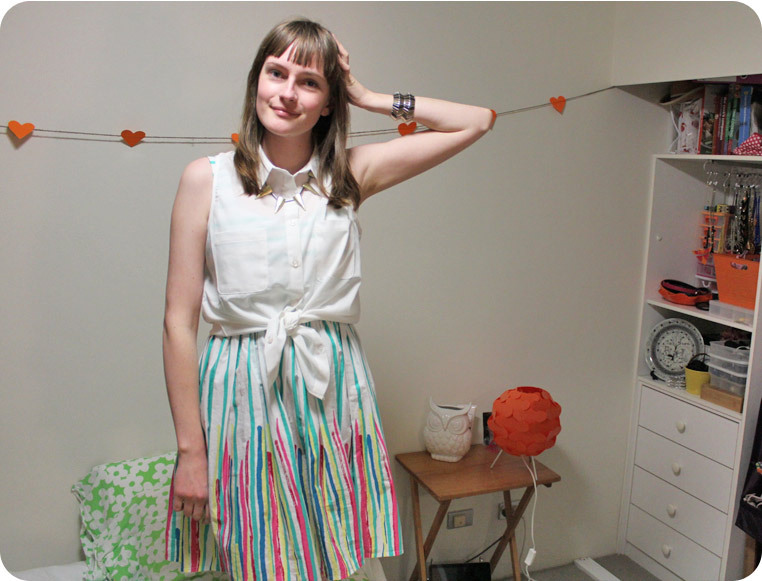 The dress-turned-skirt-for-a-day is sort of a little ‘Clarrisa explains it all’. If you are too young to know this reference you are not missing much (then again at the time I DID envy Clarissa’s Doc Martens). These photos are sort of gloomy. The lights are pretty florescent (rather than warm) in this place and the walls always seem to look gray when photographed. I vow to take less crappy pictures in future.